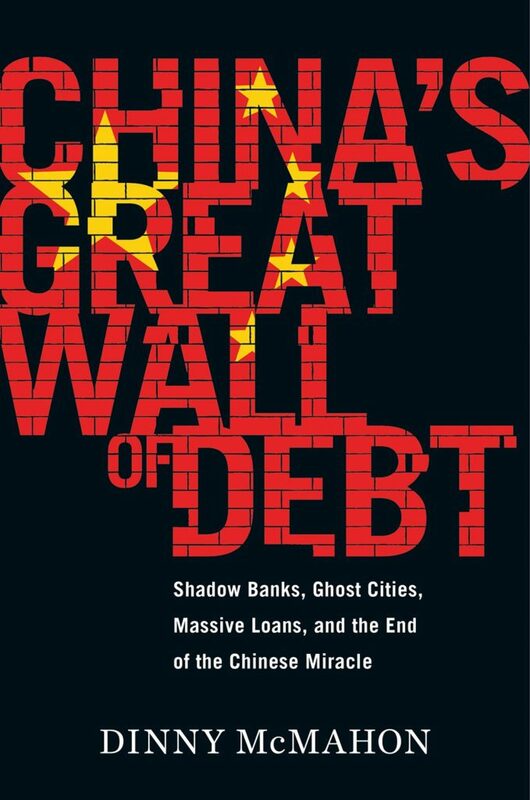 Review of China’s Great Wall of Debt: Shadow Banks, Ghost Cities, Massive Loans, and the End of the Chinese Miracle by Dinny McMahon. Houghton Mifflin Harcourt, 2018. A year before the financial crisis struck in 2008, A Demon of Our Own Design was published. Its author, a former Wall Street insider, wrote a vivid and damning account of an industry whose fetishization of complexity and incentive structure, instead of managing risk, was amplifying it. Reading Dinny McMahon’s China’s Great Wall of Debt provokes the same uneasy recognition as Demon did that the jig is up. McMahon, a former correspondent for the Wall Street Journal, is far from the first skeptic of China’s decade of debt-fueled growth. What’s different is that this book has neither the empty flash of the commentator’s talking points or the numbing certainty of an IMF report. Instead, it is a work of highly engaging reportage unmistakably clear in its implications. As the West confronted its financial reckoning in 2008, China, where 30 million people swiftly found themselves out of work, ordered its banks to stimulate the economy through all-out lending. China’s economy weathered that crisis. The problem is that the lending never stopped. With a select set of richly reported stories from across the country, McMahon illustrates a system addicted to short-term growth, causing great inefficiency and dire long-term consequences. In Sichuan, McMahon introduces a state-owned “zombie” firm, unprofitable but kept alive with tremendous subsidies. In Liaoning, McMahon reports from New Tieling, a “ghost city” willed into existence by ambitious political leaders who know that construction-fueled growth will promote them out of town well before debt subsumes the places they’ve left behind. Southwest of Beijing, McMahon illustrates why local governments are some of the country’s most prolific debtors, appropriating land and literally destroying mountains for more while trying to keep real estate prices up because it is their principal source of income. A peer-to-peer finance start-up is the lens to understanding a banking system even more adept at financial legerdemain than Wall Street, while an auction house specializing in sales of baijiu, China’s fiery liquor, explains China’s multitude of asset bubbles. China’s leaders recognize the extent of the problem – and the suspect statistics that lower officials send up to them. Since former premier Wen Jiabao declared China’s economy “unstable, unbalanced, uncoordinated, and unsustainable,” warnings from the country’s leaders have crescendoed in the Xi era but resulted in few truly substantive changes. One of the justifications for Xi Jinping’s consolidation of power and anticorruption campaign has been that it is essential for reform to have any chance. Here too, McMahon has a story, using a salt monopoly to demonstrate how entrenched vested interests inhibit reform. But McMahon has little confidence in Xi’s vision for economic reform, arguing that his focus on “supply-side” reform targets only the system’s excesses, not the fundamental structural issues and misaligned incentives that cause them in the first place. Doing so would be to undermine the centrality of the Communist Party that he seems most keen to preserve. An economic recession, which an entire generation of Chinese has never experienced, will be just the beginning of a more wrenching social transformation. McMahon describes how China’s economy will be permanently slowed by the unavoidable demographic and fiscal realities of an aging population. China’s era of growth will be over and, in its place, a new era of economic stagnation. In 2015, Lou Jiwei, the former finance minister, bluntly warned the country’s risk of sliding into the middle-income trap were “50-50.” For a population in which 80% expect their children to have a better standard of living themselves (almost the inverse of the United States), a bankruptcy of hope has the potential to be highly destabilizing in a country that already spends more on internal security than its military. In another light, Xi’s consolidation of power could be seen as a battening of the hatches. After the last financial crisis, another book explored the history of financial disasters, noting that in the euphoria that preceded each, there were always justifications for why This Time is Different. McMahon assures us that with China it is not.